It's a cat's natural instinct to bury her waste. Life would be so much easier if we could just ask our pets what's on their minds, instead of making educated guesses. Maybe you have a diva on your hands; your cat simply wants to be the next big reality star on Animal Planet's "My Cat From Hell" show. If your cat has suddenly stopped using the litter box, have her checked out by the vet. If your kitty has developed a urinary tract problem such as kidney or bladder stones, or an infection, she may be in pain. Since the pain worsens when she strains to urinate, she learns to associate the pain with the litter box. If you have a tomcat, the chances of a urethral blockage are higher than if you had a female since the males are more prone to blockages. Your kitty may be peeing in a very obvious place, such as your bed, because she wants to be sure you see it and understand she's got a problem. It's her way of saying "a little help here, please." If the problem cannot be blamed on an infection or blockage, it could be an emotional problem. Though some may say it's anthropomorphism to ascribe human emotions to animals, it's only possible to explain what's going on in your pussycat's head by using words to describe emotions such as fear or anger. It's not a leap to look at a cat who is standing on his toes with his hair sticking out and understand he's upset. Cats feel emotions such as apprehension, revulsion, annoyance or pleasure. Is anyone confused about how a cat lying on your lap purring contentedly is feeling? Your cat could be having an emotional problem about which you are unaware; perhaps someone or something in the house is causing her harm or anxiety but she cannot tell you. 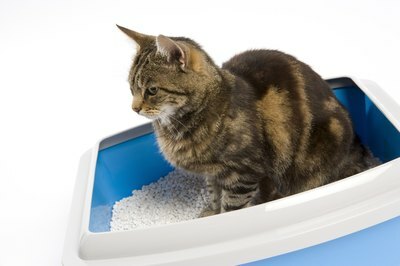 Some situations cause cats to stop using the litter box and instead use another place. The litter box may not be clean enough, there may not be enough of them, another household cat may have trapped her while she was engaged and vulnerable, she may not like the type of litter (especially if you've switched brands or type), or maybe she doesn't like the placement of the litter box or the depth of the litter itself. If she's using a kitchen mat, try making the litter more shallow in the box. If she's using a basket full of clean laundry, try making the litter deeper. Do what you can to to simulate her preference. She may be telling you she wants the litter box somewhere else. Try moving it closer to where she is peeing and inch it back to where you want it over time. There are two ways to look at a habitual problem. First, there could be a habit she has developed that has now been thwarted. Cats are creatures of habit, they like routine and order. If you put up the Christmas tree in the sunny spot where she snoozes every afternoon at 3 o'clock, she's just lost her happy place. If you bring in a new household pet or family member, or have guests and didn't consult with her first, she may be upset and is peeing out of despair. Sudden domestic violence or tension in the air over a lost job or upcoming election, or grief due to loss, are all incidents that cause changes in the atmosphere. She feels that, too. Finally, the problem may have become habitual. She may have begun peeing inappropriately because of a physical or mental problem, and even though that problem is resolved, she has now developed a bad habit. This is especially true if she has been using a place unbeknownst to you because you haven't cleaned it and the odor beckons.